I'll be flying out to the mountains of Colorado tomorrow bright and early. I am really looking forward to the trip. I'll be staying with friends, Sally and Chuck Vennel. 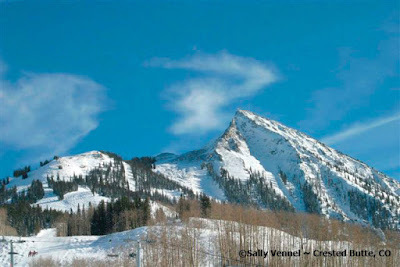 Below is a picture of the ski slopes on Crested Butte mountain taken by Sally, photographer extraordinaire. With over 24 feet of snow so far this year, lots of snow = lots of excitement!